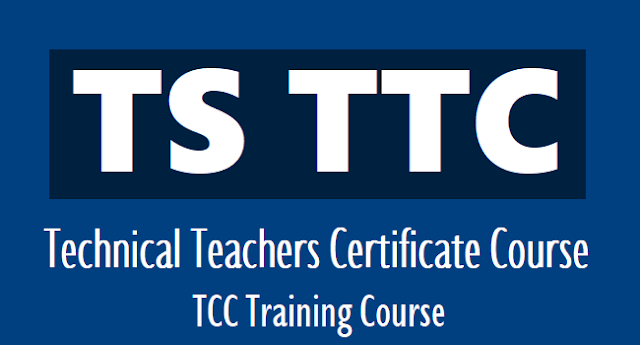 TS TTC/Technical Teacher's Certificate 42 days summer training course 2018 /Technical Certificate Course(TCC): TTC 42 days summer training Course will be conducted in Hyderabad, Warangal, Nizamabad and Nalgonda from from 16-04-2018 to 27-05-2018. TTC Trades/TCC Trades: The date of commencement of 42 days Technical Teachers Certificate Practical Summer Training Course in Hyderabad, Warangal, Nizamabad and Nalgonda from 16-04-2018 in the following Trades. While commencing of 42 days TTC Summer Training Course, rhe Course Incharge will be appointed not below rank of Dy.EO/MEO and the qualified candidates will be appointed as course instructor as per rules in vogue, and sufficient instructors may be appointed. PRESS Note: It is hereby notified that the Technical Teacher's Certificate (42) days Summer Training Course will be conducted at Hyderabad, Warangal, Nizamabad, Nalgonda and Karimnagar from 16-04-2018 to 27-05-2018. The candidates who seek admission should have completed 18 years of age and not crossed 45 years as on 16-04-2018 and passed the Secondary School Certificate or equivalent examination along with a Lower Grade Technical Certificate Course (TCC) in the Trade concerned issued by the Office of the Director of Government Examinations or State Board of Technical Education & Training (S.B.T.E.T), T.S., Hyderabad or National Trade Certificate issued by I.T.Is recognized by Government of Telangana or National Institutes such as National Institute of Handloom Weaving or Certificates issued by the Department of Industries and Commerce or Certificates in Music (Vocal) issued by Telugu University or its equivalent certificates. The candidates who are eligible in all aspects are requested to contact the District Educational Officers of the above Five Districts for Application Forms and for further details. For admission Application Forms contact above Five (05) District Educational Officers from 09-04-2018. Out of the State candidates/candidates who possess Academic / Technical Certificates issued by the Boards / Institutes other than Telangana shall obtain prior permission of the Director of Government Examinations, Telangana, Hyderabad before admission into Technical Teachers Certificate Training Course. The admissions will be made from 09-04-2018 to 16-04-2018 and the course will commence on 16-04-2018.
a) Applications have to be issued to the eligible candidates from 16-04-2018 to 27-05-2018.
c) No admissions shall be considered after 16-04-2018.
d) The candidates who desire to take admission into the course shall complete 18 years of age on 16-04-2018, and shall not cross the age of 45 years. e) The candidate shall possess a SSC Pass certificate along with professional or Technical qualification prescribed for the course concerned as per the existing instructions. f) Candidates shall be given admission to the course in the Trade in which he/she has possessed the Certificate. g) Candidates having certificate in Karnatic / Hindustani (VOCAL) shall only be given admission into Karnataka or Hindustani Music. Candidates having certificates in Instrumental Music shall not be considered for admission under any circumstances. h) Candidates shall be given relieving certificate at the end of the completion of the course. For Karnataka and Hindustani candidates Trades shall be mentioned as Karnataka vocal or Hindustani vocal only, as the examination will be conducted in VOCAL only. I) Candidates having certificates in Typewriting only shall be admitted in Type writing Trade. j) Final Theory Examinations will be conducted in Lower Grade only. Candidates who are having higher certificates in the concerned trade will have to apply for conversion into higher grade. k) For additional information, the Course In charge can contact the Director of Government Examinations, Telangana, Hyderabad. 1) Recognition have been accorded by the S.B.T.E.T. for the private industrial Training Institutes up to 1998 only and no recognition has been given later. In view of the above candidates possessing certificates issued in 1998 and prior to that year from private industrial training Institutes shall only be given admission. m) Candidates seeking admission into the Course from outside the State shall take prior permission from the Director of Government Examinations duly enclosing their Original Certificates for verification. Above instructions should be followed, while making admission into the Training course. Candidates can avail this opportunity and Officials would inform the Venue of Training centre for the convenience of the candidates concerned. Eligible candidates, should contact the concerned your DEOs for Application form and further details.